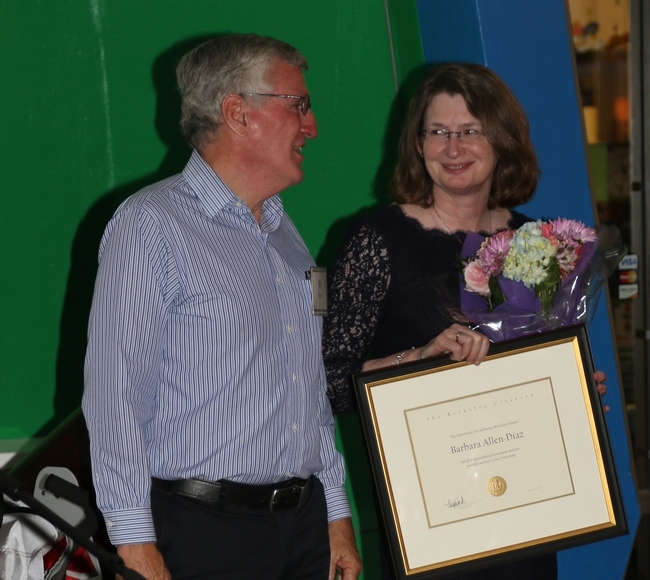 Barbara Allen-Diaz receives Berkeley Citation. 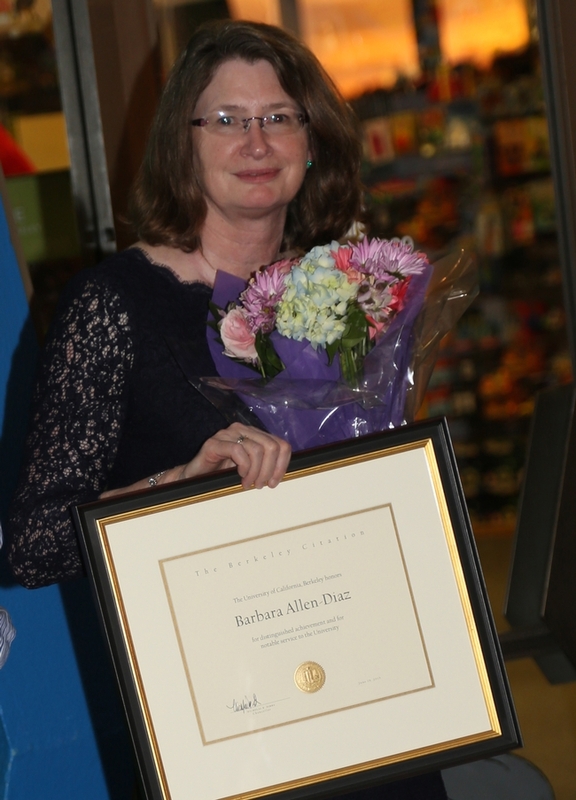 For her contributions to UC Berkeley and beyond the University, Barbara Allen-Diaz was awarded the prestigious Berkeley Citation. On behalf of Chancellor Nicholas Dirks, Keith Gilless, dean of the UC Berkeley College of Natural Resources, presented the campus's highest honor to the head of the University of California's Division of Agriculture and Natural Resources on June 19 at her retirement celebration at Lawrence Hall of Science in Berkeley. “I am incredibly honored to receive this special award,” said Allen-Diaz, who was visibly surprised and moved by Gilless's announcement. The Berkeley Citation recognizes academic achievement and University service of the highest order. In addition to her contributions as a researcher, graduate student mentor and professor of range science, Allen-Diaz has served in many leadership roles for UC Berkeley and UC Agriculture and Natural Resources (ANR). Allen-Diaz has served as a member of the Intergovernmental Panel on Climate Change, the National Academy of Sciences and the Association of Public and Land Grant Universities. She has authored more than 170 research articles and presentations. In February, she became the first woman to receive the Society for Range Management's highest award, the Frederick G. Renner Award. After earning her bachelor's, master's and doctoral degrees at UC Berkeley, Allen-Diaz took a job with the U.S. Forest Service. In 1986, she joined the faculty at UC Berkeley faculty, where she studied the effects of livestock grazing on natural resources, oak woodlands and ecosystems of the Sierra Nevada and the effects of climate change on rangeland species and landscapes. At the end of June, she will retire as UC vice president and as Russell Rustici Chair in Rangeland in the Department of Environmental Science, Policy and Management at UC Berkeley. The Berkeley Citation was created in 1968, when the University of California celebrated its 100th birthday, to honor individuals or organizations that had rendered distinguished or extraordinary service to the university. To read more about Allen-Diaz's career, see the latest issue of California Agriculture journal. Bill Frost, left, congratulates Allen-Diaz on receiving the Berkeley Citation.